The report sorts the information by the queue name and the date of the interaction that occurred in the queue. Each media type, such as calls or chats, appears in its own section. The report includes weekly and monthly totals. Fields that do not apply to the interaction type are marked "N/A." For example, emails cannot be placed on hold or abandoned. "Talk time" is the standard term for the time that the agent and customer are connected. Reports show information for all of the media types that are listed in the report's custom parameters. 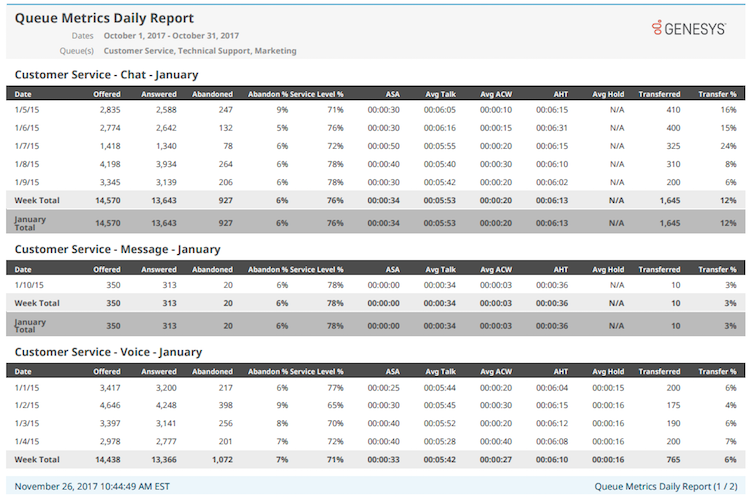 For example, if a queue only handles voice, but you select chat as a report parameter, the report includes chat statistics. Because the queue does not handle chat interactions, the results are blank. Whether you met your service level. You can further investigate problematic intervals by running the Queue Metrics Interval report. Whether you are on track to meet your monthly targets and whether the arrival patterns meet expectations. For example, do patterns continue to indicate that the busiest days occur on Mondays and the slowest days occur Fridays? Whether transfer rates and average handle times remain consistent. Ask agents why interactions run long. View wrap-up codes for transfers. Date The date of the interactions. The number of interactions where a customer disconnects in an ACD queue before connecting with an agent. For example, the customer hangs up before an agent answers, or the system disconnects the interaction. The number of transfers compared to the total number of interactions answered.